In 2015, the Maine Legislature passed Public Law Chapter 166 "An Act to Promote Recycling Program Integration and Efficiencies" which transferred administration of the Returnable Beverage Container, a.k.a. "the Bottle Bill" program to the Department of Environmental Protection. 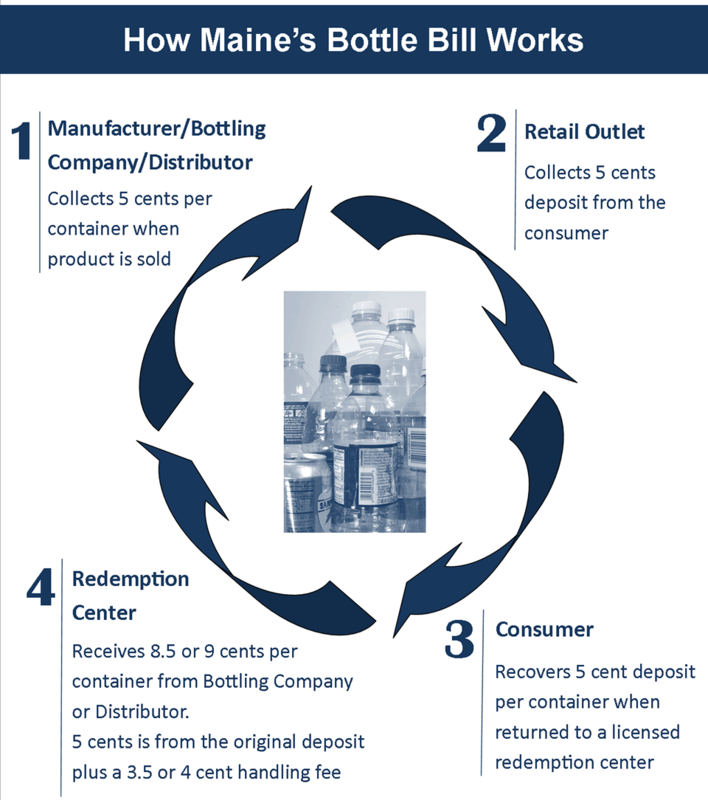 DEP is now responsible for licensing and renewals of redemption centers, registration of beverage container labels, and questions on initiator of deposit or contracted agent. For more information, please contact Scott Wilson (207) 446-1187.
a 5¢ refundable deposit on beer, hard cider, wine coolers, soda, or noncarbonated water beverage containers, and alcoholic or noncarbonated drinks sold in the State. 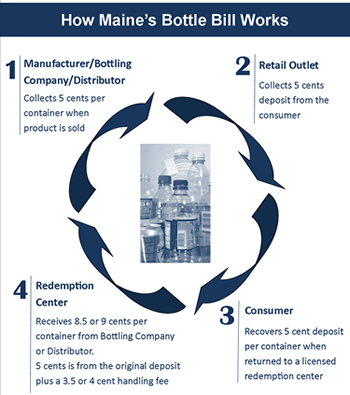 Under Maine’s beverage container redemption program, manufacturers, distributors or sellers of bottled/canned beverages begin the process collecting the appropriate deposit fee (five cents or fifteen cents) for every beverage container subject to this program which is sold in the State. Beverage retailers pass this cost onto the consumer at time of purchase by charging that deposit fee. This deposit encourages consumers to return their containers to a redemption center to reclaim their deposit. The initiators of deposit (or those working on their behalf) collect the containers from the redemption center and pay them for the deposit fee which the redemption center has already paid to the customer, plus a ‘per container’ handling fee, and recycle the collected containers. Online Beverage Container Licensing and Registration System – register your beverage container labels using this on-line portal. If you are renewing beverage container label registrations for 2018, and have not received an e-mail with instructions, please contact Kelly Webster (207) 287-7838. Returnable Container Registration List (Excel) Check this list to confirm beverage products with registered container labels to allow for sales in Maine.